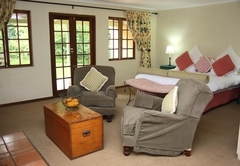 Old Halliwell Country Inn is a highly recommended Currys Post hotel providing accommodation in 14 guest rooms for tourists visiting the Natal Midlands region. 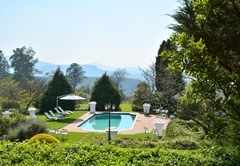 Built in the 1830’s and set on 250 acres of rolling lawns and forests overlooking the Karkloof Valley, Old Halliwell captures the charms and traditions of a more gracious age. 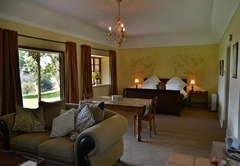 Experience our expansive rooms that overlook the spectacular Karkloof Valley from a private patio. 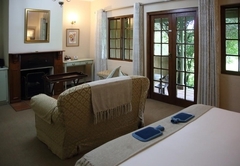 Each room caters to your every need - from the fireplace to heated towel rails to spa-baths. All our rooms have Open View HD TV and not DSTV. In the pub we have a TV with all the sports channels and Sky News. 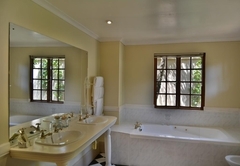 Large comfortable en-suite rooms each leading off of the garden with scenic views of rolling lawns and the vast expanse of the Karkloof valley with private patios, open fireplaces, heated towel rails and tea / coffee making facilities. 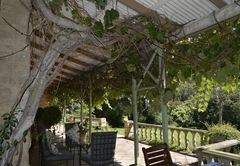 The Family Suites are the same as the Garden Rooms but are larger and suitable for a family of four. 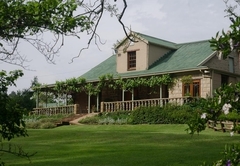 Originally built as a fortified farmhouse the main building now houses a library and games room, lounge, cosy bar with snug and cigar lounge, wrap around verandah and the Lemon and Lavender restaurant for all your culinary needs. With breathtaking views of the Karkloof Valley surrounding the restaurant, it is the perfect place to unwind and enjoy a scrumptious meal. 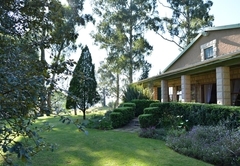 The food is honest, wholesome country cuisine with a generous dollop of passion in every dish. 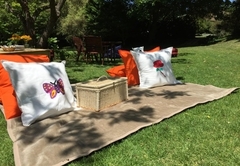 The menus comprise of breakfast, lunch and dinner with tea and scones served throughout the day. 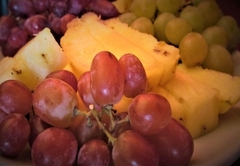 The evenings are a time to enjoy a drink in the bar and then savoring one of our creative home cooked meals. 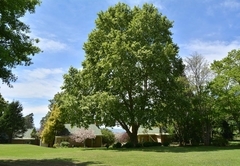 Enhancing the landscaping is the Old Halliwell Rest home for horses, where loving owners have sent their fine steeds to while away their golden years in lush green pastures in the heart of the Midlands. 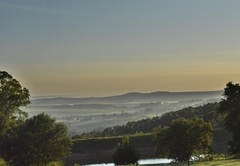 The magnificent Midlands beckons with golf courses, trout fishing, winding rivers, spectacular waterfalls, wilds flowers and abundant birdlife all yours to discover. 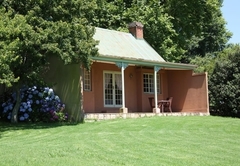 Explore the Midlands Meander Route with its many art galleries, restaurants and craft shops. 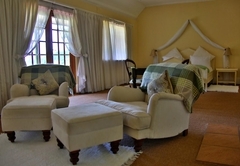 Has a King Size bed in one room and two single beds in the other room, each with their own en-suite bathroom. 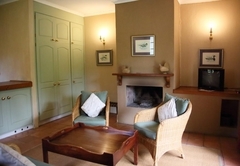 All rooms have open fireplaces, tea and coffee making facilities, heated towel rails, TV's, hairdryers and private patios. Open plan L shaped family room with two single beds and a double bed, en-suite bathroom with a bath and shower. 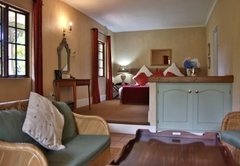 This room contains tea and coffee making facilities, heated towel rails, TVs, hairdryers and private patio. 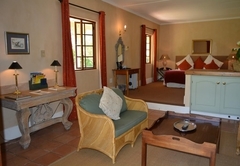 Garden suite with King size bed and full en-suite bathroom. 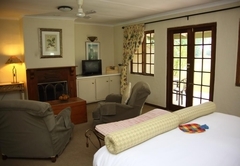 All rooms have open fireplaces, tea and coffee making facilities, heated towel rails, TVs, hairdryers and private patios. 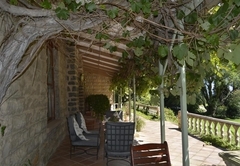 Garden suite with two single beds and full en-suite bathroom. 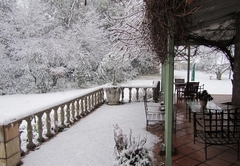 All rooms have open fireplaces, tea and coffee making facilities, heated towel rails, TV's, hairdryers and private patios. 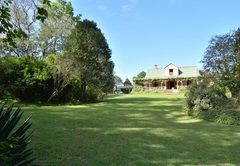 Stand alone cottages with parking facilities next to them, King Size bed, under-floor heating, large bathroom with a shower and spa bath. 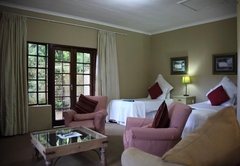 Superior Garden Suite with King bed and en suite bath and shower and separate lounge area, this room is very private and quiet. 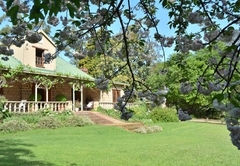 Self-catering Accommodation on the Haliwell Villa for 8 guests. Beautiful country/mountain getaway. Gorgeous rolling hills and fresh air. 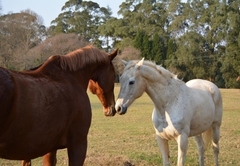 Beautiful estate with retired race horses roaming around, they even come right up to your front door. Jacuzzi in the huge bathroom was definitely a highlight for us. Room was very spacious with a lounge and a fireplace. Breakfast was delicious and the staff is just super friendly and make you feel really welcome. We like it when the manager/owners take time to just chat to us. 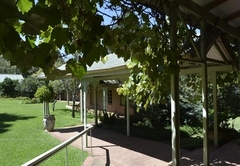 Definitely highly recommend Old Halliwell, and there is so much to see and do in the area. Welcoming environment and staff. Rooms neat and tidy. Love the chocolate on pillows at night. I would just suggest improving parking arrangement. Also google maps has the location of the venue further down curry's post road that where its actually located - might want to look into fixing that. 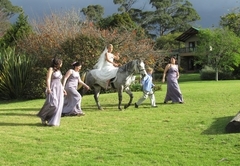 Response timeOld Halliwell Country Inn typically responds to requests in 5-10 minutes.